« Is it Really an Objection? Or your Strength? I Don't Want my Business to Perish! Great leaders are always learning. As an executive coach, I have found that most leaders understand the value of learning. Earlier today I was talking with the CEO of a “moving and storage company.” This business owner had a burning question. He asked me, “should I double my storage space?” He began describing his current dilemma and cost per square foot of the new space he was contemplating. I then asked him a very simple question, “where do you see your business in five years?” and his answer was unclear. This man has built a very successful business, but many successful entrepreneurs don’t currently have long term plans or a clear long term vision. Building a long term plan or creating a long term vision can be challenging. I sat down with my client and we built a 5 year vision. Thanks to this vision, he now has an image in mind of exactly what he’d love to see his business having accomplished in 5 years. The picture is clear. Do you have a 5 year vision? What would you love for your business? Once we have a clear vision, we are able to share this vision with our team, conveying and building team coherence. 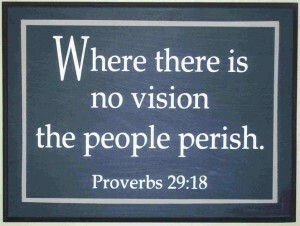 Build a clear vision and you’ll find that your results will fall in line. If you’d like some techniques and tools for “vision development,” send me a message! I have some great assets that will help you.